Following several high-profile security breaches, the Secret Service on Thursday announced it would be adding "temporary security enhancements" to the White House — including an anti-climb feature with sharp metal spikes. 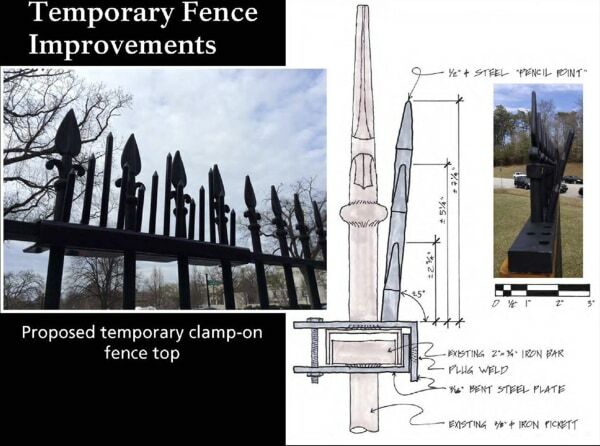 "The temporary design solution for the White House complex fence is meant to improve security, while minimizing visual impacts and respecting the significance of the White House," the Secret Service and the National Park Service (NPS) said in a statement. The new security measures will include replacing concrete barriers at vehicle checkpoints with mobile steel plate barriers, adding a new officer booth at a White House entrance and installing a removable anti-climb feature "with sharp metal points" on top of the White House fence, the agencies said in the statement. Work on vehicle checkpoints at White House entrances is expected to begin on Friday, with the enhancements set to finished by mid summer, the Secret Service and NPS said. They are working with other federal agencies to develop more permanent security enhancements for the complex. "The feature is meant to deter and inhibit individuals who may attempt to climb over the fence," the statement reads, adding that work on the spikes is expected to begin in early July and take about four weeks. "This temporary measure will be in place until a long-term solution is implemented." The announcement comes after a series of breaches and attempted breaches in Washington— including a shocking incident in September where a man scaled the fence, making it all the way to the East Room of the White House while carrying a knife on him before he was tackled and arrested. Officers found a machete and hundreds of rounds of ammunition in his car. Omar Gonzalez, 43, pleaded guilty in March to unlawfully entering a restricted building or grounds while carrying a weapon and assaulting, resisting, or impeding certain officers or employees following the Sept. 19 breach, according to the U.S. Attorney's Office for the District of Columbia. He is facing between 12 to 18 months in prison and will be sentenced on June 8. Last month, a Florida mailman landed in a gyro-copter on the West Lawn of the U.S. Capitol in a political protest, also prompting questions about the Secret Service's ability to protect the nation's capital.